Once a critical part of the longest electrified railroad in the world, the broken concrete foundation to your left is all that remains of the two-story, brick East Portal Substation. Essentially a gigantic electric vault, East Portal was the largest of 22 substations constructed along the Milwaukee Road’s electrified portion of the main line from Harlowton, Montana to Tacoma, Washington. East Portal was one of four substations given gabled roofs to shed deep snow. Built in 1915, salvagers in the early 1980s tore the building down for its valuable brick. The substation housed three transformers and three powerful generators which converted 100,000 volts of alternating current from Thompson Falls Dam into 3,000 volts of direct current. This energy provided the power to propel electric locomotives over the Bitterroot Mountains. Substation automation beginning in the early 1950s allowed East Portal operators to remotely control three adjacent substations. The Milwaukee cut back the three-man crews at these remote controlled substations to reduce labor costs. in the 3,000-volt system at each substation, substation operators made volt meter and ammeter recordings showing the output over each 24-hour period.Because of fluctuations in the 3,000-volt system at each substation, substation operators made volt meter and ammeter recordings showing the output over each 24-hour period. This volt meter recording made at East Portal on May 10, 1969 shows the higher voltage made by supplying current to distant trains or regenerating electric locomotives returning power to the substation. Lower voltages occurred when heavy trains were motoring upgrade. Location. 47° 23.798′ N, 115° 38.093′ W. Marker is in East Portal, Montana, in Mineral County. 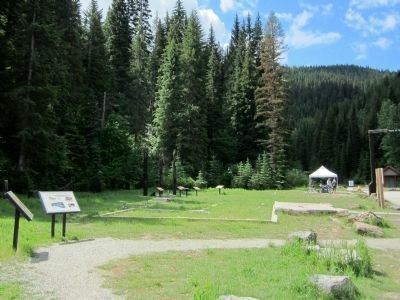 Marker can be reached from Rainy Creek Road (Federal Road 506) 2 miles south of Exit 5 (Taft) (Interstate 90). Touch for map. Located at the Route of the Hiawatha Trailhead. Marker is in this post office area: Saltese MT 59867, United States of America. Touch for directions. Other nearby markers. At least 8 other markers are within walking distance of this marker. Life Along the Line (here, next to this marker); Pluck and Good Fortune (a few steps from this marker); A Battle That Could Not Be Won (a few steps from this marker); When the Mountains Roared (within shouting distance of this marker); An Unlikely Safe Haven (within shouting distance of this marker); Building From the Ashes (within shouting distance of this marker); Douse the Flames and Climb Aboard (within shouting distance of this marker); The Route of the Hiawatha (within shouting distance of this marker). Touch for a list and map of all markers in East Portal. On the center right is a photo with the caption, "Two EF-4 little Joes growl past the East Portal Substation, west-bound, on their way to Avery, Idaho sometime in the late 1960s." More. 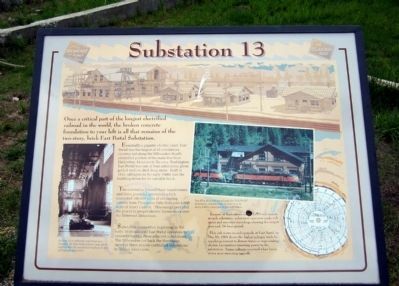 Search the internet for Substation 13. Credits. This page was last revised on June 16, 2016. This page originally submitted on August 4, 2011, by Bernard Fisher of Mechanicsville, Virginia. This page has been viewed 525 times since then and 5 times this year. Photos: 1, 2. submitted on August 4, 2011, by Bernard Fisher of Mechanicsville, Virginia.